Tired of standing in line for the treadmill? 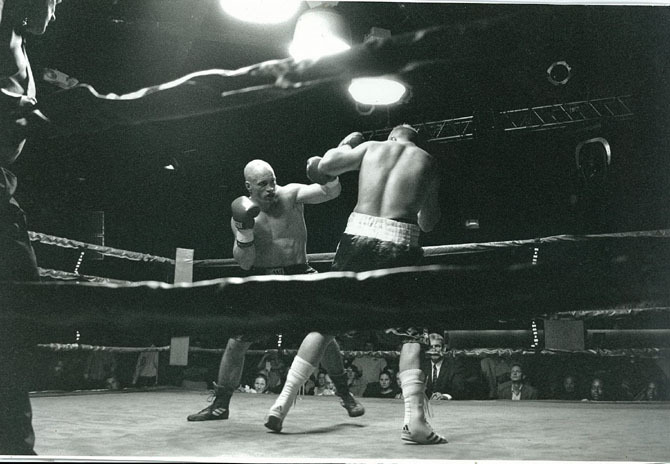 Frustrated by the competitive atmosphere at gyms? Are you on the lookout for a good customized quality workout, just for you? No matter your age or current physical shape, you deserve to feel healthy and happy. Personal Body Precision is a private personal training studio that specializes in one-on-one fitness and nutrition guidance. Customized workout with profesionally certified, sensitive trainers help you minimize injury and optimize efficiency to get the results you've been unable to get elsewhere. Best state of the art equipment, towel service, complementary health snacks, private showers and bathrooms. Personal Body Precision has all the perks without membership fees and no overcrowding waiting for equipment. If you're not getting results, it's time to get rid of your routines of inefficient exercises and avoid injury with professionally certified trainers and honest encouragement. Come visit us today and exercse your right to train with precision! 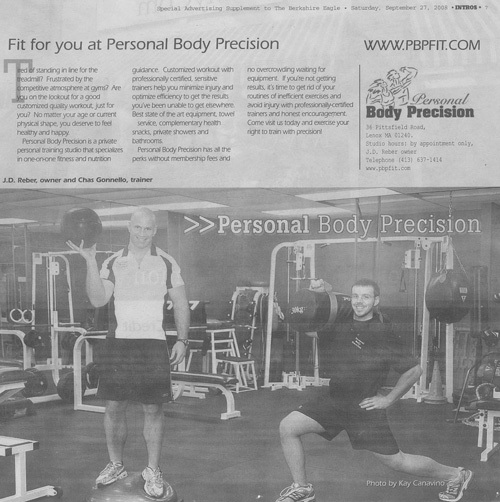 We were recently a featured facility on the Power Plate website. "Personal Body Precision (PBP) is an elite personal fitness training studio located in Lenox, MA, equipped with a Power Plate pro5 that the studio’s trainers incorporate into personal training and group training sessions. Founded by J.D. Reber in 2004, PBP offers one-on-one training, group classes, and nutritional guidance, all led by highly experienced and knowledgeable CSCS trainers. In addition to Power Plate equipment, PBP has built a state-of-the-art facility with Keiser Trainers, Vertimax equipment, and much more. One of their most popular group classes is the “TNT Bootcamp,” which incorporates training ropes, boxing, TRX, tires, and Power Plate training. Other group classes include Iron Boxing and the Biggest Loser class." Clockwise, from top left: Denise Jenkins wants her son C.J. to slim down, but he is reluctant to give up fast food. 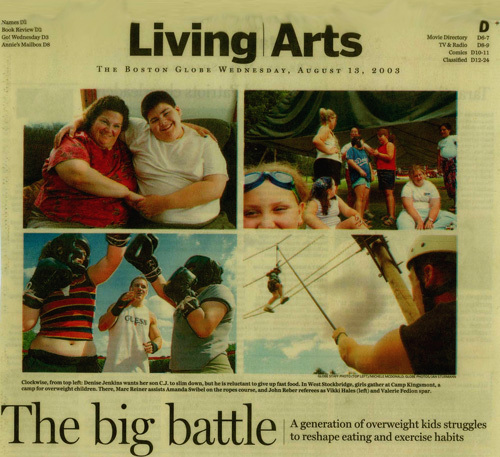 In West Stockbridge, girls gather at Camp Kingsmont, a camp for overweight children. There, Marc Reiner assists Amanda Swibel on the ropes course, and John Reber referees as Vikki Hales (left) and Valerie Fedion spar. LENOX - John Dawson Reber does not simply own a business, he lives the business. A certified personal trainer for ten years, Reber worked at Studio 21 in Great Barrington before opening his own private fitness studio at 36 Pittsfield Road in Lenox. He founded Personal Body Precision in 2003. His knowledge of nutrition is the result of a Bachelor of Science degree in Exercise Science, but his involvement in sports led him to hands-on training. 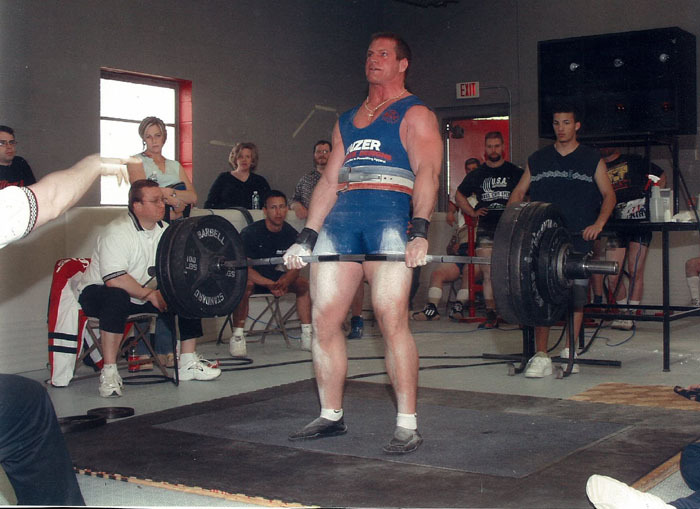 Interested since he was eight, John, or "JD", has competed as a national power lifter and holds the New England record for the bench press and the dead lift. 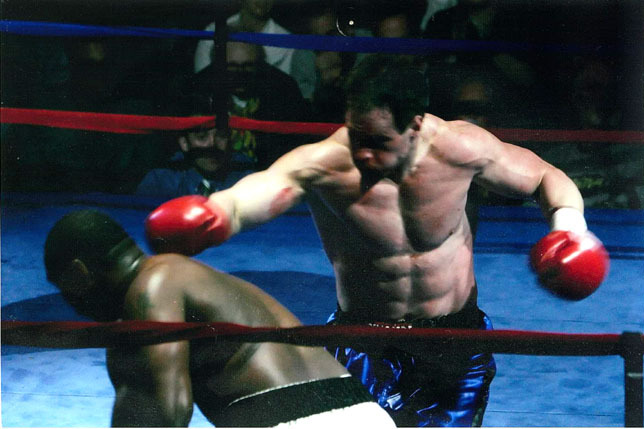 He is a Golden Gloves boxing champion as well as a professional boxer. He is also a member of the National Strength and Conditioning Association. 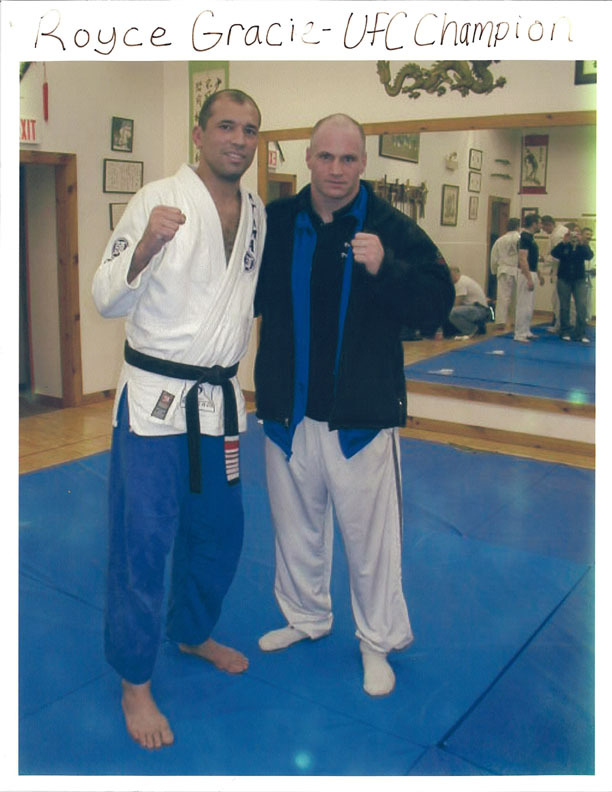 For Reber, the thrill is not in his own accomplishments but in a client's pursuit of health and wellness. In his ten years of personal training work he has helped people of all ages and backgrounds live healthier lifestyles. Reber says the hundreds of clients he has worked with vary from housewives and businessmen to committed athletes on all levels. His studio provides the opportunity for people to get away from the spandex-clad masses at local gyms and receive from one-on-one fitness guidance. "Anybody who wants to improve the quality of their life and feel great" will benefit from his services, Reber said. His training sessions involve customized weight, cardiovascular, and eating plans as well as access to a members-only library filled with additional information about improving your body.. In that library there are several DVDs featuring Reber. He has created a "Total Body Sculpting" and a "Total Abs Workout" that have been made into movies. He also wrote a book called "Personal Body Precision: The Fitness Training Manual." Clients have access to heart rate calculators and charts, motivational support, and goal setting, as well as a customized stretching program. In todays technologically advanced world, Reber says the need for a personal trainer to ask questions and get informtion from is even more important. He explained that much of the equipment today and many weight loss programs are actually detrimental to the individual. Today, equipment is created with ease in mind, often having the participant sitting or lying on a bench. This creates a two-directional path of motion, often neglecting key muscles and opening the door for future injuries. In addition there are a number of diets and supplements that are not healthy ways to lose weight. Clients of Reber, throughout his ten years of experience, have hailed his ability to give them the results they desire. Missy Keenan lost 91 pounds in nine months. "This program has helped me to restore my confidence and gain self esteem. I look forward to meeting my goals one step at a tome," Keenan said. Reber has worked with minor league baseball prospects as well as student athletes.